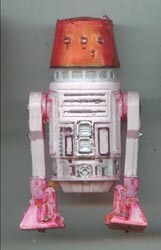 I made all my R5s, and now Hasbro is slowly starting to make them, so I'm repainting them into minor background R5s that I save for just that reason. 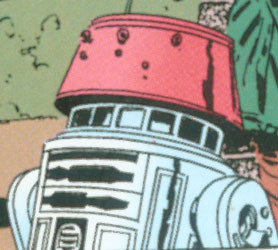 This droid was once R5-X2, which posed a challenge, as repainting a red droid white, results in a pink droid. I scraped off as much as possible, and did five or six coats of paint before finally getting it like this. The feet were impossible due ot all the nooks, cranies and odd angles, so I wound up leaving them red - after all, they aren't visable in the single panel, so they could be any color.